Rondo again pointed to the fact that he was wearing a mouthguard, which would impact his ability to intentionally spit on someone, and said the league catered to Paul’s “good guy” image when deciding the length of the bans. 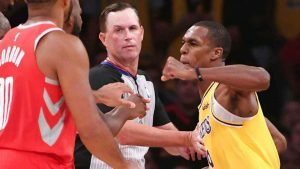 In making its decisions, the NBA evaluated a video shot courtside that appeared to capture Rondo spitting into the face of Paul at Staples Center, league sources told ESPN on Sunday. The Rockets’ video staff took the footage courtside during the game, and it was shared with the league office, sources said. “Y’all are playing me with these tricks or these mind games, tampering with the evidence,” Rondo told ESPN on Tuesday. “Ain’t no way that I intentionally spit on you with my body language the way it was. “One, if I spit on you, bottom line, there is not going to be no finger-pointing. If you felt that I just spit on you, then all bets are off. Two, look at my body language. If I spit on you on purpose, I’m going to be ready for a man to swing on me. You ain’t going to have my hands on my hip and my head look away at someone if I spit on them. After the [expletive] goes down, within 30 seconds, you run and tell the sideline reporters that I spit on you? If I spit on you, you are trying to get to me. You not trying to make up a story so you can look like a good guy. It makes no sense to me.